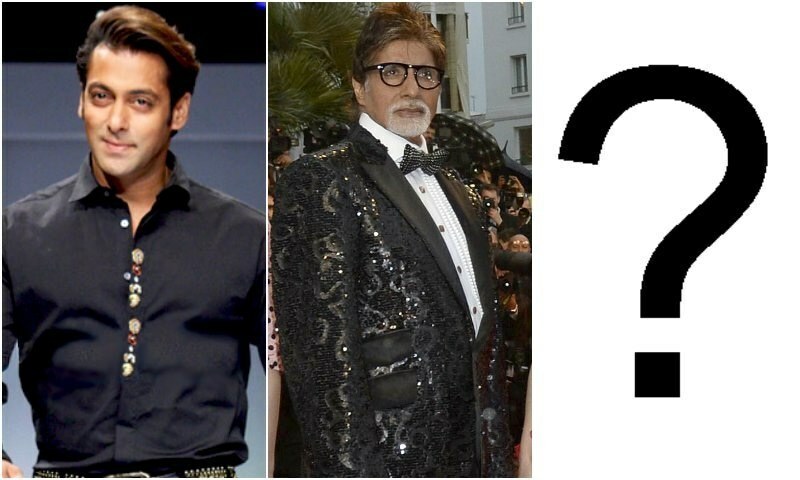 Salman Khan and Amitabh in Forbes Top Paid Actor List - No Pakistanis on it? Interestingly but not surprisingly, no Pakistani actor made the cut. Bachchan and Khan tied for the seventh spot on the list, with estimated earnings of $33.5 million this year alone. Akshay Kumar also appears right after them in the top 10, leaving behind many Hollywood A-listers, with his $32.5 million haul. For the first time ever, the highly awaited list included actors from different industries around the world. Forbes described it as "the first truly global earnings tally of leading men". Robert Downey Jr. may have topped the list with $80 million in tow but Chinese superstar Jackie Chan bagged the second spot with $50 million in earnings. Four out of the top 10 men hailed from outside of Hollywood. Interestingly but not surprisingly, no Pakistani actor made the cut. The only name that comes to mind who could have possibly be included is Fawad Khan but how much he earns has always been an ambiguous matter. Let's be honest: If notable big stars like Shah Rukh Khan and Aamir Khan are missing, the chances of Fawad being on it are a case of us being delusional and hopeful. The Pakistani film industry might be going through a revival but it'll be years, maybe decades, before we get to the level where homegrown talent and movies make millions of dollars. For now, the only way a local actor could even dream of being on the list is by taking the Chan route, that is to make your name so huge that you could slap it on anything and people will buy it for a steep amount. Jackie's wealth comes from him selling branded merchandise and he also owns a Segway dealership, as well as a cinema chain. Other actors on the list were Vin Diesel, Bradley Cooper, as well as Adam Sandler, despite a dry box office run. Since fawad is very new in bollywood he would be paid around 5 lakh rupees for his films and not more. He should immediately demand 20-30 million dollars for a movie or threaten that he will quit bollywood. That will get the attention of indian producers. List is showing the growing power of Indian Film Industry and also the growing power of Indian economy.. Indian talent has become omnipresent in the world..in everywalk of life from Technology to entertainment..
No Pakistani in the list of Top paid Actors! Don't worry, in another list of Top earned politicians - Pakistanis made up from top to bottom. Enjoy! Lest see next year's Forbes ranking. By that time, Salman will have two new releases - Sultan and Prem Ratan Dhan Payo. Shah Rukh will have two new releases too - Fan and Raees. Salman makes a huge amount of money from his "Being Human" clothes line. Lets wait for Eid 2016. Congrats to these hard working actors. They truly deserved it. I don't think any Pakistani can ever make this heavy weighted list because market is still very small for Lollywood movies compare to Bollywood which is world wide known after Hollywood. why do you think all Pakistani actors and actress are running towards Mumbai..Fame and MONEY..
From all Pakistanis I think Ayyan Ali should be there as she super model earning millions!! Bachan and S Khan earning more than Caprio.. Sad news indeed. @Rajputana, India has advantage of population of being One Billion Indians. Pakistanis get paid peanuts in Bollywood. Indian producers are too smart for them. Hope Pakistan realizes what it is missing out by cutting itself off from the 1.2 billion market next door . Bollywood movies are watched by both Pakistan and India diaspora living abroad, that is why Indian actors are among the Forbes list. @Kamal Pasha The advantage of population was 5 or 10 years back also. There is no harm in accepting that these people have worked hard to earn their global position. Indian film industry has worked hard to make its own place under the sun. @Kamal Pasha my dear Sir do you think that all 1 billion people sit & watch only movies.. please think with an open mind there is a huge market for Indian films. Film like 3 idiots did excellent even in China. Salman Khan and Amitabh in Forbes Top Paid Actor List - No Pakistanis on it?... Is it so important to compare everything with India, we need to change our mind set. Why Shan is not in the list? @Kamal Pasha, from Morocco to Indonesia, indian movies are flavour of life.furthermore not all 1.3 billion indian doesn't necessarily watch Billy wood movies.Regional movies are well developed...many a time superior then hindI movies.Rajnikant, Tamil superstar movies are hugely popular in Japan. Hindi movies are drawing talent in all field from across the world.and pakistan is not an exception. Akshay Kumar do 4 films in a year, that is why he is on 8th position with $44m. Exactly. Shah rukh khan is popular in Peru. Some Brazilians also know our movies. @Abbas Ali Bcoz he doesn't earn enough! Pakistan film industry is far behind Indian film industries. That is why many Pakistani stars are moving into Bollywood to get fame and wealth. If successful maybe in the coming years they too will stand chance to be in the list. Bollywood made the industry, because they are very professional and dedicated. Thats why our Pakistani artists are there too. Our media can make a big roll now, and in next 10 years you will see a big change in Lollywood. But why should be a Pakistani into it ? "Pakistani Actors not in list". Are you kidding?? Indian top actors charges much more than the whole budget of any average size Pakistani movie. Tax collectors must be very hard on Amitabh and Salman Khan! @azad They are good tax payer. Even Akshay Kumar did a promotion for Incom Tax Deptt. in Mumbai to motivate the people for paying the Taxes. @Malik Bollywood will let him go immediately, since they know Fawad would earn more in Lollywood. What a joke. Even zayad khan,tiger shroff, nawazuddin, rajpaul yadav like indian actors must be earning more than fawad khan. let fawad khan just give one are two hits, you people will start comparing him with amitabh bachan.And also you will say that world is not recognising him beacause of the conspiracy of the world against pakistan. What is this list, the top three haven't even acted in 3 years. Other than money earn there is nothing comparable. for at least cameo role in world Hollywood films.Most of the Bollywood actors earn from endorsement of diff brands with in this subcontinent. @Furqan Alas, how can Indian be successful right? I don't know but Why Rajnikant is not on list ?? He earned lot more than so many fresh hindi actor. Hats off to Big B for making the list inspite of breaking with tradition of Bollywood of being the eternally young hero! salman and shahrukh are lucky to be in India. They have had great opportunities and they succeeded. shahrukh must be thanking his parents daily for moving to India from peshawar. For Indian actors to be on the list is more impressive because the buying power of those dollars is much more in India than in USA. I don't know how much the movie ticket in India is but it is about $ 8-10 in USA. Which translates to about Rs 600 in India. Shah rukh Khan is not missing on the list he is mentioned on no.16. @JAGMOHAN Its not the price of the movie tickets. In multiplexes they are comparable tot he world price. The prime factor is screen numbers. Its only about 4000 screens (Multiplex) in India compared to about 20000 in US alone. The disposable income in two countries is very different. And Hollywood has way bigger International market. @Malik nice thought bro but if he demands this much amount, he will be on first flight back home. Amitabh, Salman, Shahrukh and Akshay are the actors who have given decades of their lives in mumbai film industry and helped shape the industry which you see it now. Fawab no doubt, is charming and talented. He will have to dedicate at least a decade of his life to hindi film industry to be able to demand that sum. @Hema Malini Hema jee ! I love your movies - Sholay and Andaaz. You are the best ! @Malik . If fawad khan does that then he will have no movies in India..and then go back to pakistan doing TV ads and daily soaps. There is no shortage of good looking actors in India.. He is just another brick in the wall. I would compare gross revenue Avatar 17000 crore vs any indian film of any language of anytime max 1000 crore inflation adjusted. We are long way to go. @JAGMOHAN well bajrangi opening weekend ticket sold for 700 inr in bangalore. This was actual no black. @Dimpu India is progressing rapidly.It will be the most populous country by 2025 and will not have enough resources to feed its own people. @Abdulla Hussain it is human tendency to compare with neighbours first. Ideally one can just aim to be best in the world. Larger part of these earnings is nothing but countries economy, affordability along with currency strength. It would not be a surprise if we see some Pak celebs in the list but their earnings will come from non-Pakistan movies. Be it Hollywood or Bollywood or some other wood. There is NO Muslim in the list who is from the Muslim world. Even Muslims are making entry in high pofile lists through India. Well done India! @Malik 5 lakhs is closer to the amount top stars of TV serials get. He is probably getting atleast 10 times that figure, if not more. @JAGMOHAN In Delhi , Gurgaon and faridabad (NCR region) , the cost of movie tickets is Rs 300~700. Price vary with movie to movie and also with timing of show.Weekend shows are usually costly. Compared to Bollywood, Pakistani movie market will be a regional market like Tamil, Telugu etc., It is due to population and reach. So there is no point in competing with Bollywood, instead should work with Bollywood like how Bahubali did... With that said, Indians love Fawad. Just look at Salman Khan.... Any Pakistan actor can match his style, looks & hard work..??? A big NO. So stop comparing with Indians. SRK is the second most richest actor in the world with having 600 Million $ total wealth. Don't believe me? Just google " Richest actor in the world". @Malik You can demand whatever you want but chances of getting it are slim. Do you know the difference between 5 lakhs and 30 million US dollars ? Guess not. good article.but why the comparison? @natey hollywood has entire world as their movie market. In many countries its market share is more than local industry. Bollywood market is in north india only.hence,its commendable that btown actors in top list. @Asif No offense but south Indian film industries of Telugu, Tamil and other languages are bigger than Lollywood. I was surprised by watching the quality of Bahubali (Hindi dubbed from Telugu). I found the southern Indian film Bahubali a trend setter in India, no Bollywood movie is close to it's in terms of quality, technology and direction on that type of war / historical themed movie. BAHUBALI is a must watch in a good quality theater. @Kamal Pasha, hmm. Watch new south Indian movie BAHUBALI in a good theater (I watched the Hindi dubbed version from Telugu), believe me your perception will change as mine..
@Malik who cares? if not him someone else. Bollywood actors are far behind when it comes to acting, compared to their hollywood counterparts. There is no comparison. Its a open secret how the list is made! I hope that the Indian actors are paying their taxes. Have they given any money for charity to none religious organization? In next 8-10 years Indian film industry will match up Hollywood budget and revenue too. 3 starts already in top 10. According to IMF and world Bank till 2020 india will be world 5th largest economy in the world so bollywood will also be benefited. BAHUBALLI movie (250 cr budget) recent product of Indian cinema has better quality and better IMDB international rating then Hollywood movies like TROY (imdb rating 7.4) and 300 with 9.4 out of 10 BAHUBALLI has better special effects then TROY and 300. Right now only 10 % of Indian population watches movies in thetre and we are just after Hollywood. If it will exceed 25% then we will be ahead of Hollywood too. @Kamal Pasha two billion, world over. @VSG What are you talking about? Sharukh's grandfather Shahnawaz Khan was one of two top generals in Netaji Subhas Bose's Azad Hind Army! @Nex Thats bad introduction. Many people may ask who is Sonam kapoor ? She appeared in movies with unknown or supporting heros (many). Better would be introduction that Fawad appeared with daughter of Anil kapoor who was super hero 30 years back. Indian super heroes are doing lesser movies comparing to super starts of Rajesh khanna era. First of all, Pakistan should remove lol from lollywood. Then their movies and actors will be taken more seriously . "Let's be honest: If notable big stars like Shah Rukh Khan and Aamir Khan are missing, the chances of Fawad being on it are a case of us being delusional and hopeful." Why must we always compare ourselves to the Indians, we need to get over this complex. @FAM finally something sensible. well done FAM! just let people be wherever they are and strive to do the best you can. This incessant comparison and downplaying the other doesn't do any good to anybody. its not like you get a million dollars by comparing yourself to someone else or down playing someone else. @Malik Someone must be really stupid to pay Fawad 20-30 Million USD for a movie. Why not take Salman for same money who will guarantee success!! The entire Pakistani film industry budget would not make one single Indian film. @Rajputana Indian politicians are richer than US politicians, and most Indian politicians are crooks. @Malik He is sensible, he knows which side of the bread the butter is. And this is only their declared income. Most deals in India are done with black money involving Swiss banks. If their true net worth is calculated including all their money abroad, they would be worth much more than any Hollywood actor. Amitabh is the beyond any comparison , he is the absolute. Our politicians are already on the 'highest paid actors'list! Don't worry, we're well represented..........! Today at 9:30 am, Eros Films announced that Bajrangi Bhaijaan crossed 500 cr revenue world wide. Eros Films shares soared by over 60%, beating market expectations. We have a long list of Pakistani 'actors' missing. They are excellent actors and make millions of dollars a month. They include leaders of political parties, ministers and MPs. No offence man.The best films are made in Malayalam.it doesnt have any financial budget nor technical or graphical quality of world class.But the soul of film lies in script.And nobody can argue that there is no other film industary in India which perform parr with Malyalam scripts.Again no offence but Mohanlal is the best actor than Amitabh bachan.So my advice to Pakisthan friends is first make yout script right..And you will succede.Just look the numbet of bollywood films have remaked from Malayalam film industry. You have the potential but sadly you have made a mess out of it. India has a long way to go. Bollywood has money due to India's huge population, and overseas Indians. Beyond that Bollywood does not attract many. Most of Bollywood is low quality copycat version of Hollywood. That's why I know of no Indian film winning Oscar. No Bollywood movie has won an oscar. Bollywood is rich due to India's huge population and overseas Indians also. It is far behind international movie standards in quality. However, Pakistani movie industry is nothing before Bollywood simply because the whole culture is geared toward hate and suspicion of arts, modeling, acting. No Pakistani father would dream of her daughter becoming a good actor, the whole industry is linked with brothel and red light district to this day, so there can be no comparison, not competition. Having said this, Pakistani talent shown in Pakistani dramas is great. It can have huge popularity in the world if advertised well. Bollywood is an excellent example of money over class. No Bollywood movie won oscar and very few bollywood movies have won any international prestigious award. Internet website ratings are nothing. @Arvind Kumar Mayank ..... are you ignorant. Bollywood market is from Morroco to Indonesia. HAHK was running in England for 1 year. Fawad is busy on the indian border!